Two of Me&Ro's gold and diamond rings are spotlighted in this NY Times article. If Barneys New York's Hippie Holiday windows are any indication, the peace symbol is having a comeback. To commemorate the symbol's 50th anniversary, Robin Renzi of Me&Ro has reimagined the iconic graphic for a new generation in the form of a floral vine engraced onto a pendant. "I figure the more peace symbols out there in the world the better," she told The Fashion Informer. The pendant is available for sale on Me&Ro's website. A shaky economy has affected consumers in a number of different ways: while some are simply cutting back across the board, others are looking to put their money where their values are. That is the kind of customer new jewelry line Ruff&Cut hopes to appeal to, with the help of established designers such as Todd Reed and Me&Ro. The entire collection is made of conflict-free diamonds and recycled gold, and for every piece that is purchased, 10% of the retail price goes to an NGO in Africa that works with metal and gemstone miners or other jewelry industry workers. Me&Ro's designs for Ruff&Cut range from around $3,000 to $16,000. Me&Ro opened their newest store on Chicago's Oak Street today, joining David Yurman, Judith Lieber, and Harry Winston on the newest hot spot for designer jewelry. Here are a few shots of the store's interior. 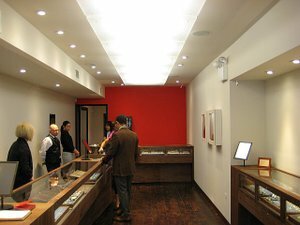 It's no surprise that cities such as New York, Los Angeles, and Las Vegas have been successful markets for fine jewelry. Now, Women's Wear Daily reports that luxury jewelry retailers are flocking to the Midwest, specifically to Chicago's upscale Oak Street neighborhood. 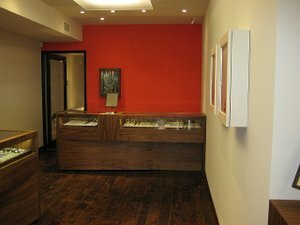 Since 2004, the area has become a jewelry hot spot with the opening of stores by David Yurman, Harry Winston, Graff, Judith Leiber, Lester Lampert, and Trabert & Hoeffer. 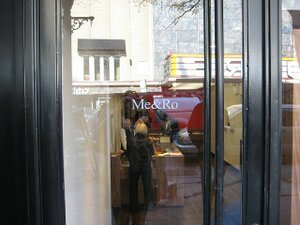 Joining that illustrious list will be jewelry favorite Me&Ro, soon to open a 900-square-foot store on Oak Street, next door to Jimmy Choo. 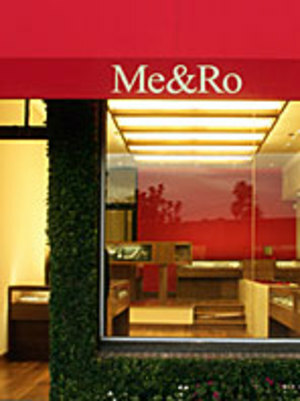 Me&Ro COO Rachel Barnett says, "Oak Street has become a mecca for luxury jewelry." The company has already seen much success in Chicago wholesale locations such as Barney's and Neiman Marcus. "We've done very well in Chicago," notes Barnett. Me&Ro projects $2 million in first-year sales at the Oak Street location. Shoppers can expect to find classic Me&Ro styles at the new store, as well as many limited-edition styles designed with stones such as sapphire and tourmaline.